This new generation IR thermometer is designed in accordance with industry standards to meet process performance requirements in hot environments of 400-3000°C and provides exceptional accuracy. 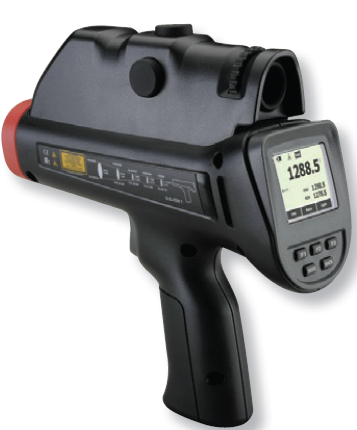 The portable Raynger 3i Plus IR thermometer is ideal for use in high-temperature industrial applications, such as iron and steel, metal refining, foundry and processing operations, ceramics, semiconductors, and chemical and petrochemical furnaces, as well as heat treatment and power plants. It is a robust solution for improving process quality and productivity, resulting in improved business performance. The Raynger 3i Plus Series offers a number of advanced features to optimize performance with high accuracy (±0.5% +1°C), such as high optical resolution, faster exposure/processing time and a large memory capacity, setting new industry standards for the measurement of process temperatures, especially under extreme conditions. The thermometer utilizes a rugged casing material that has withstood a one-meter drop test. Additionally, the use of a "Red Nose" heat-resistant warning detector and alarm reduces the risk of the sensor overheating, minimizing repair costs while averting costly accidents and ensuring operator safety. The Raynger 3i Plus provides large optical resolution and a superior Distance-to-Spot (D:S) ratio, enabling accurate measurement of temperature targets from longer distances, and with its Red Dot sighting feature, the user has a precise indication of where the temperature is being measured. Each 3i Plus thermometer includes Raytek DataTemp Windows PC software, which supports real-time communication, data storage, graphing and analysis, Lithium-ion battery, carrying case, mini USB port adapter, mini USB-to-jack converter for charging battery separately and operators manual. The Raynger 3i Plus Series models 1M (700-3000°C) and 2M (400-2000°C) meet a wide range of process temperature detection and fault previewing requirements. Each unit comes with built-in dual laser and the option of a scope in addition.